She was one of the biggest stars on television at one point of time. Several of the shows that she did will remain etched in people’s mind for a long time. 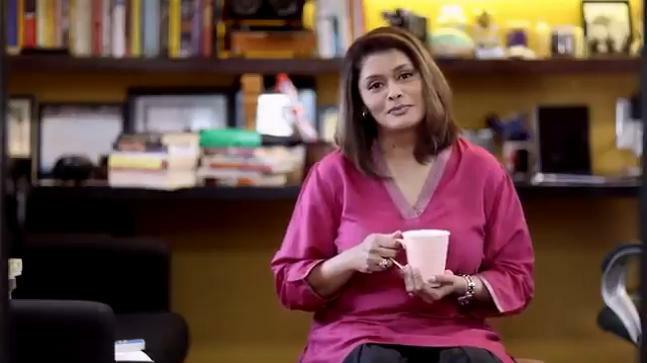 Today, Pallavi Joshi might not be doing a lot of work but the actress is happy devoting a large part of her time to her family. In this exclusive interview, she talks about her new show ‘Bharat Ki Baat’, husband Vivek Agnihotri, why it is different from Shyam Benegal’s iconic show ‘Bharat Ek Khoj’, aversion from social media, being selective when it comes to work and upcoming projects. How did the idea for ‘Bharat Ki Baat’ come to Vivek and you? The idea was to do something positive. Our children were in 10th and 12th standard respectively and we gave them an option to choose between internet and cable. They opted for the internet as they needed it to make notes and read study material. That was a very happy phase in our lives because we were not watching television and there was no news. We realised most news channels show negative news and do not talk about the positive things happening in the country. We are a vast country and there is so much unity between people. Why don’t we talk about the good things that have happened? I spoke to Vivek about it and then, the idea started taking shape slowly. A lot of research must have gone into making the show. Yes, we put together a research team and did research for six months. We stumbled upon a lot of interesting facts. A lot of people do not know this but about 80-90% of the innovations have been invented by India during the Vedic and Indus Valley civilization. We hope after watching our show, they will get some positive information about the country. Shyam Benegal had made an iconic show called ‘Bharat Ek Khoj’ in 1988. Did you, in any way, get inspired from that show? No, our show is completely different from the one Shyam Benegal had made. It was based on Jawaharlal Nehru’s book ‘Discovery Of India’. The show was a dramatized version of that book. Roshan Seth was playing Jawaharlal Nehru and acting as the sutradhar. Here, we have not staged anything. We have chosen topics like agriculture, digital India, renewable energy, arts and culture. We take the people through the history of India and show the greatness of our country. Vivek is very vocal on socio-political issues on Twitter. You, on the other hand, are not on any social networking website. Why? We have a very democratic setup at home. All of us have our own sensibilities and we act according to them. I do not like the idea of being on social media. I think it is a waste of time to share your opinions and convincing people about the same. Has there been any instance when the two of you have had differences in political opinions? Marginal differences in our views do crop up at times but most of the times, we are on the same page. I am a little centre of right. My views have always been moderate in nature. Vivek has always been an extremist in nature and that is what I love about him. He used to be a very heavy smoker at one point of time. Once I expressed my concern over his health and told him that he must try and quit smoking. He gave up on smoking and has not smoked since the last sixteen years. You have been very selective about your work of late. I had no intention of doing less work. Something just changed when our children came into our lives. One day, I came back from work and saw my daughter playing with my mother-in-law. A while later, my mother-in-law went inside the kitchen to make some tea. Suddenly, my daughter started crawling. I was about to get the camera to record it when my mother-in-law informed me that she had crawled earlier that day. I got very upset about the fact that I missed out on seeing an important thing. Tears started welling up in my eyes and I realised that I cannot be missing out on seeing my children grow. I was doing ‘Alpviram’ at that time. I had my son a few years after that. After that, I realised it was not possible for me to continue working actively. I took a break for two years. After that break, I started working behind the camera. I had been working pretty actively as a producer but acting did take a backseat and I have no regrets about it. As a producer, it was easier for me to manage my working hours. You got trolled for featuring in the video on the Rafale deal, which was directed by Vivek. Vivek and I thought of making videos where we can share our views on government policies. We started with a video on GST. Then, we did videos on surgical strike, demonetization and then, on the Rafale deal. The video on the Rafale deal was shared by the PMO handle. A lot of people started thinking that it was a BJP sponsored film and started trolling us for that. The fact is that BJP had nothing to do with the video. I wanted to direct a film earlier but then Vivek and I struck a deal. We decided he will never act in a film and I will never direct.